Arlington, Va. - August 26 2014 - PBS Distribution today announced it is releasing The Roosevelts: An Intimate History on DVD and Blu-ray September 16. The Roosevelts , a new seven-part, 14-hour documentary by Ken Burns, weaves together the stories of Theodore, Franklin and Eleanor Roosevelt, three members of one of the most prominent and influential families in American politics. The series marks the first time their individual stories have been woven into a single narrative. "The Roosevelts have played significant roles in other stories we've told before, from the National Parks to World War II," said Burns. "It's impossible, in fact, to visit many parts of the American experience without encountering their presence. But beyond simply sharing a bloodline or political success, they each shared a passionate belief that America is at its strongest when everyone has an equal chance. And on a personal level, they each struggled to overcome their own fears while maintaining a public face of courage." The Roosevelts will be available on DVD and Blu-ray September 16, 2014. The suggested retail price of the DVD is $99.99 and the suggested retail price of the Blu-ray is $129.99. The run time of the documentary is approximately 14 hours on seven discs. 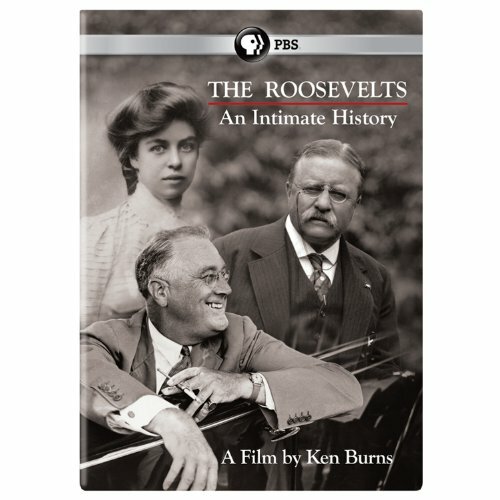 The DVD and Blu-ray include special features - 13 bonus videos, making of "The Roosevelts," and deleted scenes with an introduction by Ken Burns. This film will also be available for digital download. The Roosevelts follows the family's story for more than a century, from Theodore's birth in 1858 to Eleanor's death in 1962. Over the course of those years, Theodore would become the 26th president of the United States, and his beloved niece, Eleanor, would marry Franklin, a fifth cousin of theirs from a different branch of the family, who became the 32nd president. Together, they redefined the relationship Americans had with their government and with each other, and redefined, as well, the role of the United States within the wider world. The series encompasses all the history the Roosevelts helped to make - the creation of National Parks and the digging of the Panama Canal, the New Deal and the defeat of Hitler, and the postwar struggles for civil rights at home and human rights around the world in which Eleanor Roosevelt played a central role. But it is also an intimate human story about love and betrayal, family feeling and personal courage and the conquest of fear. Legendary actress Meryl Streep portrays Eleanor Roosevelt in readings from her personal letters and writings. Of her performance, Burns said, "As we've seen time and time again, Ms. Streep is a magician. Here, she completely transformed herself into Eleanor Roosevelt, simply through her voice. It was remarkable to witness. The entire cast delivers what I consider to be some of the finest voice-over work we've ever been fortunate enough to present." The Roosevelts is written by longtime Burns collaborator Geoffrey C. Ward, who is an authority on Franklin Roosevelt. The author of two biographical volumes, A First-Class Temperament and Before the Trumpet, he is also the editor of Closest Companion, which revealed for the first time Roosevelt's close friendship with his distant cousin, Daisy Suckley. Ward's interest in FDR grew in part from the fact that he, like FDR, is a polio survivor. Funding is provided by Bank of America; Corporation for Public Broadcasting; Public Broadcasting Service; Mr. Jack C. Taylor; The Arthur Vining Davis Foundations; National Endowment for the Humanities; Rosalind P. Walter and members of The Better Angels Society, including Jessica & John Fullerton; The Pfeil Foundation; Joan Wellhouse Newton; Bonnie & Tom McCloskey; and The Golkin Family. The Roosevelts: An Intimate History is a production of Florentine Films and WETA, Washington, DC. Director: Ken Burns. Writer: Geoffrey C. Ward. Producers: Ken Burns, Paul Barnes and Pam Tubridy-Baucom. Editors: Paul Barnes, Tricia Reidy and Erik Ewers. Cinematographers: Buddy Squires and Alan Moore.